Location : Ramada Chennai , Central Chennai, India. Location : Chennai Trade Centre, Nandambakkam, Chennai. Time: 1 & 2 February: 10:00 AM to 06:00 PM. 3rd February: 10:00 AM to 05 PM. Time: 10:00 AM – 06:00 PM. KCBMA, Microsoft, Samadhan and Sysfore Technologies are coming together to organize an event to empower the corrugated sector. Date : 18th July 2015. On March 21, 2014, a seminar was organised by Bengal Chamber of Com-merce and Industry in which SAMADHAN presented how “Microsoft Dy-namics NAV can get you Control, Profit and Growth”. Gain better insight into how your business is performing. Get greater visibility into how resources are being utilized. See the video Click here. Target your most profitable customers. Use the system to drive behavior in your business. 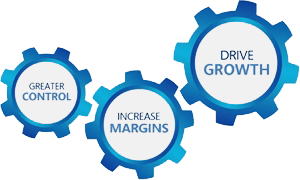 SAMADHAN has offered free di-agnostic service to four companies and helped them to understand how they can bring Control, Growth and Margin in their organization. If you are an owner of company or associated with an organization and also want to enable these keys to success. You may also give a call to us on +91-651-2331882.